Abu-Fadil speaking on evacuation on Capitol Hill. 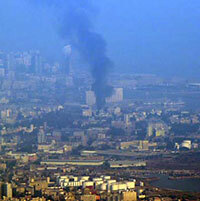 Abu-Fadil sees grain silos at Beirut port bombed by Israel. Amphibious landing craft to evacuation ship. 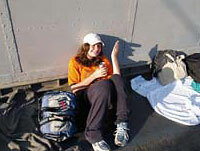 Evacuees settle in on USS Trenton. 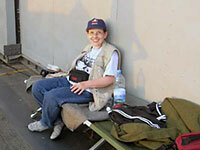 Patriot Village at Incirlik air base. 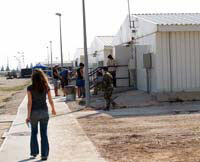 Abu-Fadil shared barracks with several families. 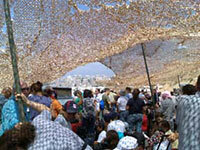 Evacuees arrive in Philadelphia four days after leaving Lebanon. Breakfast forum with Senator Russell Feingold. Congressmen Boustany & Issa at evacuees’ session on Capitol Hill. Institute for Professional Journalists director Magda Abu-Fadil addressed members of Congress, legislative staffers, federal government officials and ArabAmerican leaders in September urging them to help Lebanon rebuild following Israel’s 33day summer onslaught on the country. She narrated a Power Point presentation of photos taken during the evacuation, deaths of Lebanese civilians and damage caused to Lebanon’s infrastructure during the summer war, including to LAU’s new Business Building. The session for eyewitness accounts from Lebanon preceded a lunch honoring Arab-Americans in the federal government. The Arab American Institute placed great importance on the need for Congress to hear personal observations from people who witnessed the war and had a unique perspective on the U.S. government’s responsibilities to help rebuild Lebanon. A day earlier, a special plenary session on humanitarian assistance to Lebanon and Palestine featured international agency officials who updated conferees on their work. The conference September 1012, 2006 grouped Arab-American national leaders with political and policy experts and served as a forum for Arab-American action in the November 2006 elections. Because the conference fell on the fifth anniversary of the 9/11 attacks, AAI hosted a number of commemoration events including a community dialogue with partners in the civil rights and ethnic advocacy organizations, a luncheon with interfaith messages of hope and a banquet with a keynote address about the legacy of September 11 for Arab-Americans and U.S.-Arab relations. The conference opening session featured the ambassadors of Iraq and Palestine and the Charge d’Affaires of Lebanon. Conference discussions focused on how to communicate effectively with one’s member of Congress and tools to make a difference in a political campaign. Participants took part in a breakfast forum with Senator Russell Feingold. Rep. Ray LaHood listened to e yewitness accounts of the U.S. evacuation and Rep. Darrell Issa spoke about visiting Lebanon to assess the damage and plan for assistance. Senator John E. Sununu and Rep. Charles Boustany attended the lunch honoring Arab-Americans in government.